If you know me, you know I’ve got a slight obsession with peacocks and peacock feathers. Part of it stems from growing up in Arcadia and the other part is just because they’re insanely beautiful. Mumbles’s grandfather even has a few at his home, which is always fun for me. (Proof: here and here.) Even our wedding had a bunch of peacock feathers and hues, so it’s no mystery that there are still some lingering in our home. How I’m going to refrain from becoming the crazy peacock lady, I have no idea. I see a future where everything I own may or may not have a peacock on it because surely when my friends and family see such things, they’ll think “Jenn will love this!” and they’ll be right. Well, here’s a lady I just discovered who is wholeheartedly not helping with this problem. Meet Starla Michelle Halfmann. 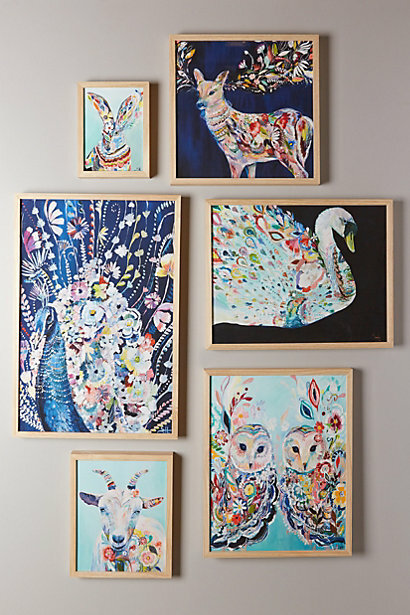 I discovered her work via Anthropologie (swoon) and it’s just absolutely gorgeous. I want everything she makes but this print is definitely on my Dear Santa list.